As of April, the micronized rubber powder produced by Lehigh Technologies had been used in more than 500 million tires. The automotive industry has been recycling tires for nigh onto 100 years, originally motivated by the high cost of buying rubber. It’s a process not without controversy: Many castoffs ultimately are burned after the most valuable materials have been scrapped. On the other side, many argue that's a better option than burying tires in landfills. But the conversation detoured into new territory in late 2017. That’s when French tire giant Michelin acquired Lehigh Technologies, a 15-year-old company that reincarnates end-of-life tires into a specialty material called micronized rubber powder (MRP). The substance is already used by more than 60 companies (among them are seven of the world’s 10 biggest tire makers) for a wide range of applications, including as a feedstock for the sorts of high-performance tires Michelin sells. It is sold to more than 42 plants in 15 countries. Lehigh is being run as an independent subsidiary: Its second manufacturing plant in Murillo del Fruto, Spain, is set to come online in July. The company’s process works with scraps that already have been stripped of metals and fibers, using liquid nitrogen to turn the remaining rubber cold enough so that it can be pulverized into a fine composite. 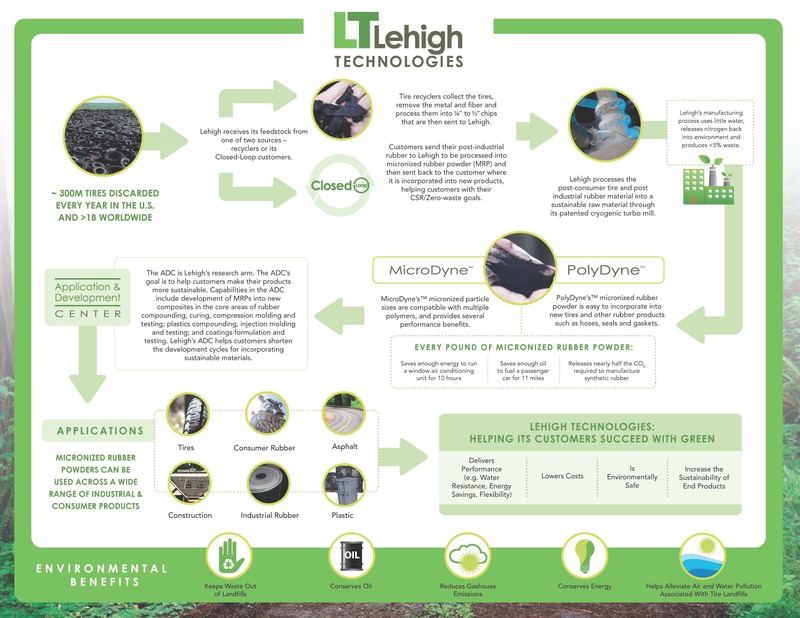 Lehigh sources that material from tire recyclers or as part of closed-loop arrangements with tire manufacturers. Aside from diverting waste, the MRP material later helps to save energy in the tire production process, according to the company’s marketing materials. The process works with scraps already stripped of metals and fibers, using liquid nitrogen to turn the remaining rubber cold enough so that it can be pulverized into a fine composite. The new European facility, which will have an initial annual capacity of 10,000 metric tons, is on the same site as a local tire recycler, which will ensure a steady stream of feedstock. Lehigh's first plant in Tucker, Georgia, is the world's MRP manufacturing site with an annual capacity of 140 million pounds. Aside from these operations, Lehigh’s technologies will become increasingly integral to Michelin’s shift toward a closed-loop production cycle that uses fewer raw or virgin inputs, according to the company's top executive. "They have been looking for ways to have a significantly higher presence in recycling of materials than they have in the past," Lehigh CEO Alan Barton told me. "This fits into our strategic direction." To be clear, MRP currently replaces just a small percentage of the material required to make new tires. But as of April, it has been used in more than 500 million new tires and retreads. Roughly 1 billion tires are headed for disposal annually worldwide. Roughly 1 billion tires are headed for disposal annually worldwide, including more than 300 million in the United States, according to industry estimates. Traditionally speaking, the biggest non-fuel markets for tire scraps have included civil engineering projects for applications such as embankment fill or as an additive for asphalt, where it helps prevent cracks. With Michelin’s muscle behind it, Lehigh is actively developing new applications for MRP, ones that go beyond the markets traditionally associated with scrap rubber. It’s finding its way into plastics, consumer goods, coatings, sealants, construction materials and even car parts. For example, the durability and longevity of the material make it appropriate for use in the foam that’s part of car headrests, Barton said. The carpet and flooring industry is another potentially large market; it turns out that MRP could be useful as part of underlays. Some manufacturers, such as Mohawk, already actively embrace the use of recycled materials. Last year, it repurposed 42 million pounds of old tires into welcome mats. "The biggest gating factor is the time it takes to test and introduce new material," Barton said. "There’s no such thing, really, as a drop in." For customers seeking to use MRP in their products, that could involve a half-year of work in the laboratory to produce samples, followed by several months more for a production trial, before the product can make it into the field for test marketing.